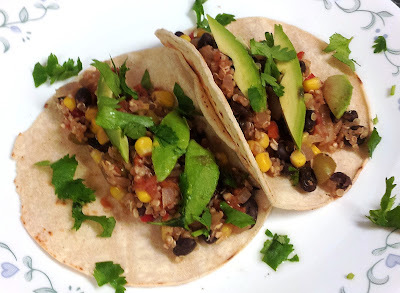 Have you ever heard of Picadillo? Apparently it is a Latin American dish but varies from region to region. I read this on Kevin's blog Closet Cooking. He has amazing recipes. This vegetarian version looked positively delicious! What attracted me at first to this was the quinoa. I loved the mixture of vegetables with the quinoa and black beans. Very filling and healthy! 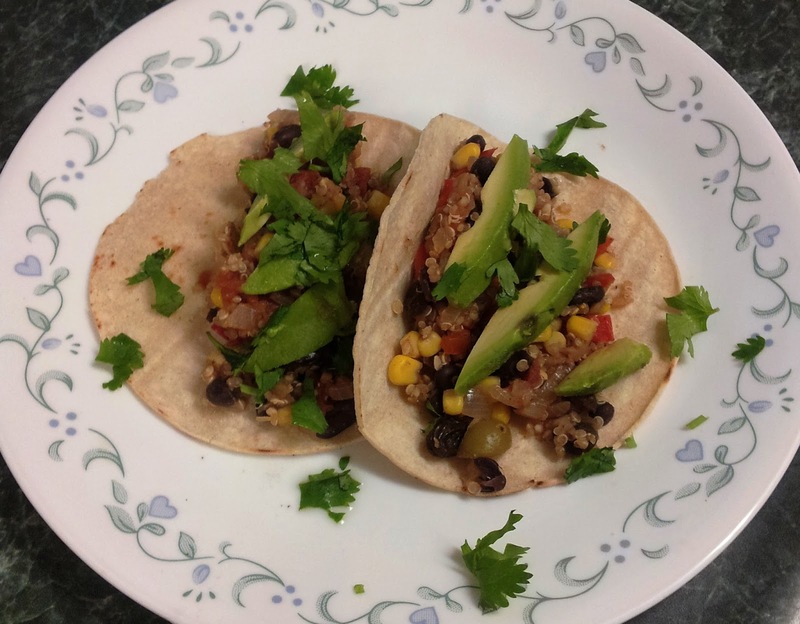 Despite the fact that I don't care for olives, I did enjoy them in these tacos. The sweetness from the raisins were an awesome touch too. I know that I will make these again! 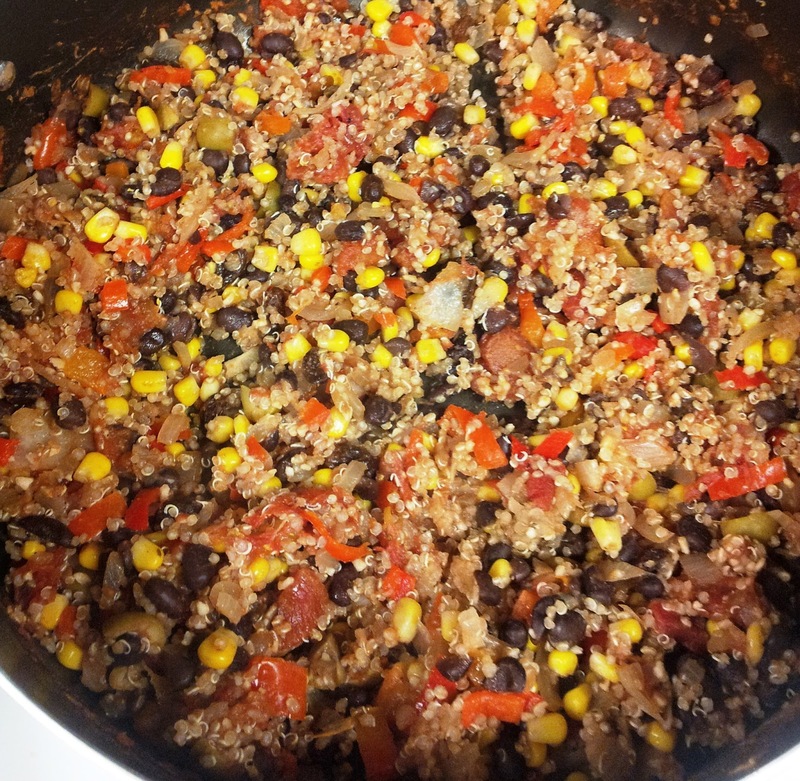 Bring the quinoa and water to a boil, reduce the heat and simmer covered until the water is absorbed and the quinoa it tender, about 15 minutes. Meanwhile, heat the oil in a pan over medium-high heat, add the onions and bell pepper and cook until tender, about 7-10 minutes. Add the jalapeno, garlic and cumin and cook until fragrant, about 1 minutes. Add the beans, tomatoes, oregano, cinnamon, olives, raisins and capers, bring to a boil, reduce the heat and simmer for 15 minutes. Season with salt, pepper and cayenne to taste, mix in the vinegar and cilantro and remove from heat. Serve the picadillo on the quinoa or mix it all up. I put about half into the mixture and left half on the side.